Mark Douglas served in the Air Force for 31 years, retiring as a Colonel. 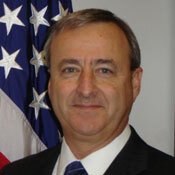 He has extensive expertise in Air Force supply chain operations and innovations and managed many Air Force data systems at both HQ AF Materiel Command and the Standard Systems Center. He also worked as a supply chain consultant for IBM and CSC, before joining ARRAY Information Technology, Inc. in 2013. What's Plan B when a federal CIO's important IT program crashes and burns?